How would you like to discover a new, easy way to learn Italian? 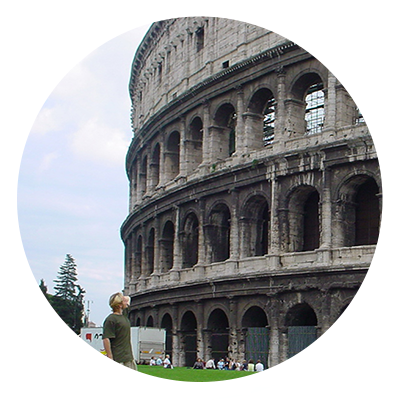 With my learning methods, you can become a relaxed and confident Italian speaker in just a few months. Speaking Italian opens doors to a world of travel and adventure. New experiences. A new job. Connecting with new cultures. Impressing friends with your language smarts. Wooing a lover with your new-found romantic streak. A new lens for thinking and viewing the world. Italian is widely spoken in over 10 European countries, and is an official language in Italy, San Marino, Vatican City and Switzerland. More than 100 million people around the world speak Italian. There are plenty of good reasons to learn Italian. It makes sense that Italian is one of the top choices for language learners in the Fluent in 3 Months community. So, why do so many people struggle with speaking Italian? I’m Benny Lewis, bestselling author and founder of the Fluent in 3 Months website. I’m fluent in seven languages - including Italian - and I’m able to speak confidently in many others. You may have seen me speaking at TEDx or featured in the National Geographic magazine. Yet I don’t consider myself a “natural born” language learner. I am a failed language learner who persisted. Italian was the second new language I learned to speak, after Spanish. I moved to Italy to learn Italian, but I struggled to get a full immersion experience. Why? I was working a 63-hour-a-week job as a youth hostel receptionist, with mostly English speaking tourists coming in. So, I had to use every single spare second I could find to practice Italian. Because time was scarce, I developed learning hacks to help me learn Italian quickly and easily. These simple language hacks helped me learn Italian much faster than most people - despite the constraints on my time. The more Italian I spoke, the more of these language hacks I discovered. Whether you want to learn Italian for business, school or leisure, I will show you that learning a language doesn’t have to be difficult. Why Italian is Easy is not a language course. It’s an approach to learning Italian. You’ll pick up simple shortcuts you can use to be confident at speaking Italian even if you don’t have a complete vocabulary and perfect grammar. So, remember: Why Italian is Easy is NOT an Italian course. But it IS a completely new way of thinking about how to learn English. You’ll learn the exact shortcuts I used to become a confident and fluent Italian speaker in just a few months. You want to learn Italian, but you’ve got a job, plus family commitments, and life happens… How can you fit learning Italian around a busy working day? This guide shows you how to immerse yourself in the Italian language every day. You’ll learn exactly what resources you can use, and when, to maximize your exposure to Italian. By signing up for Why Italian Is Easy, you’ll have lifetime access to the material, plus any updates that get released. I'm certain that Why Italian Is Easy will revolutionize your approach to learning Italian. If for any reason it doesn't, I insist you have your money back. Just email me within 30 days of joining, and I'll send your refund. No questions asked.